coefficient of restitution (.830) or C.O.R. Coefficient of restitution is a measurement of the energy loss or retention when two objects collide. The coefficient of restitution measurement is always expressed as a number between 0.000 (meaning all energy is lost in the collision) and 1.000 (which means a perfect, elastic collision in which all energy is transferred from one object to the other). 1.The clubface and the ball are made from completely different materials. 2. The clubhead and the ball are of two totally different weights, or masses. It has been found that the COR of the collision between lets say a stainless steel driver head, which does not have any Spring Like Effect (SLE) and a standard ball is about 0.78. In 1998 The USGA set the COR limit for woods (metal woods) at 0.822 with a test tolerance of .008 effectively taking the limit up to 0.830. The current USGA rule limiting the coefficient of restitution of a clubhead states that the COR cannot be higher than a measurement of 0.830. This means that when the clubhead impacts the ball, there cannot be more than an 83-percent transfer of the energy of the head to the ball. To relate this to your golf game-Comparing when you were playing those stainless steel drivers back some years ago and now the new titanium spring-faced drivers, you have gained 21 yards of distance- assuming a driver swing speed of 100 m.p.h. For every increase in C.O.R you gain 4.2 yards. It is true that as swing speed increases, the distance difference is greater. And likewise, as swing speed decreases the distance difference for each increment of the COR measurement is less. This is one of the reasons why the USGA rule which limits the COR of a clubhead has the effect of penalizing the slower swing speed golfer much more than the high swing speed player. The characteristic time of the clubhead shall not be greater than 239 µs. A maximum test tolerance of 18 µs is associated with this test. Therefore a maximum characteristic time of 257 us. or units, is allowed. 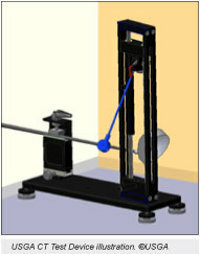 This test measures the response of a shafted golf club. If there is no shaft in the clubhead, one must be temporarily installed prior to testing. The normal procedure calls for the measurement to be made at the face center, and is meant to replace the old coefficient of restitution method.